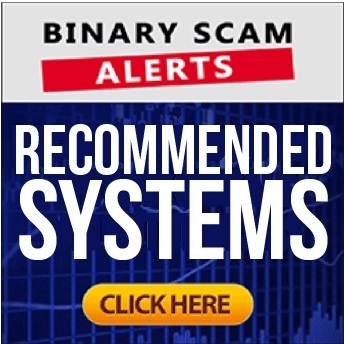 Binary Scam Alerts » Scam Reviews » Kiyosaki Formula Review, SCAM Robert Kiyosaki Formula Exposed! 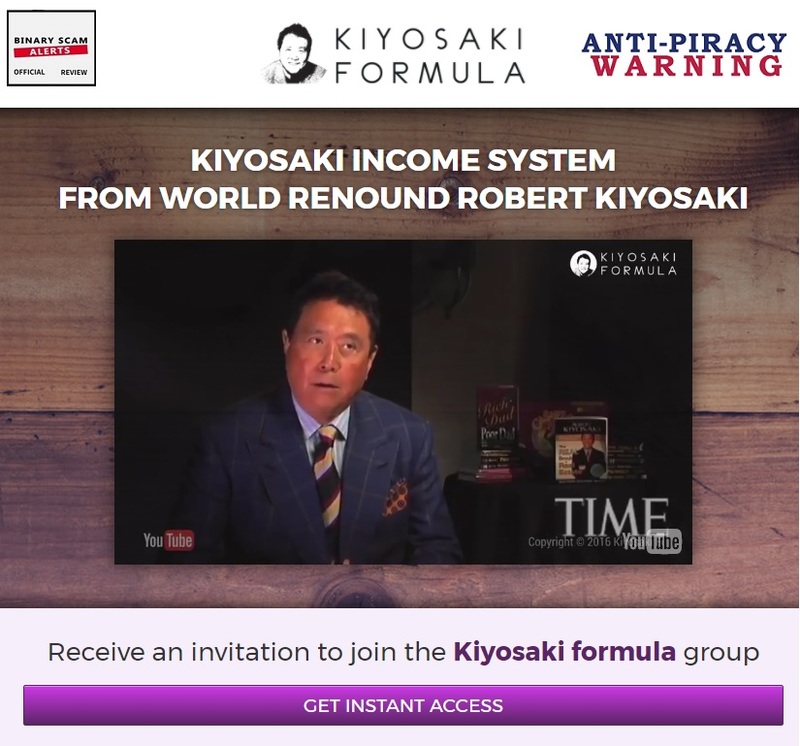 The Kiyosaki Formula by Robert Kiyosaki is a SCAM software and trading robot, and we blacklisted it in our factual and insightful review and investigation. First and foremost you should be aware that Robert Kiyosaki is a real person and while considered to be controversial at times, he is widely recognized by many people as a successful wealth Guru. That being said, the con artists pulling the strings behind the Kiyosaki Formula are in effect piggybacking on his reputation and in doing so directly committing the crime of copyright infringement. This means they can be fined up to $250,000 and sentenced to as much as five years in a US penitentiary. Needless to say we have already reported them to the FBI and Justice Department, and also messaged Mr.Kiyosaki in regards to this malicious investment fraud. We know that at first glance this app may seem as genuine or legit, but this is far from the truth. This is a bona fide get-rich-quick scheme designed by crafty affiliate marketers with pure malice and the deliberate intent to victimize and defraud innocent day-traders and opportunity seekers. It goes with out saying that this is an blatant attempt to deceive, bait, and mislead potential customers. That is the reason why we consider this scheme to be so dangerous. Keep reading to see how we exposed these crooks and why we believe the Kiyosaki Formula is a confirmed financial scam. Below you will see the main sales page for the Kiyosaki Formula software. It states that it is the “Kiyosaki Income System from world renowned Robert Kiyosaki”. When we contacted Robert he seemed genuinely distraught and immediately contacted his lawyer to see what kind of legal actions he can take. We believe this website will be taken down very soon, although one can never really know. Here’s all the proof you will ever need. The image below illustrates the registration form in the member’s area of two other scams which utilize the same fraudulent software. It’s plain to see these crooks simply changed the graphics and sales video, but are using the same technological infrastructure to peddle their filthy little app. Notice how the forms are almost identical, all they did was switch the design and color scheme to match. 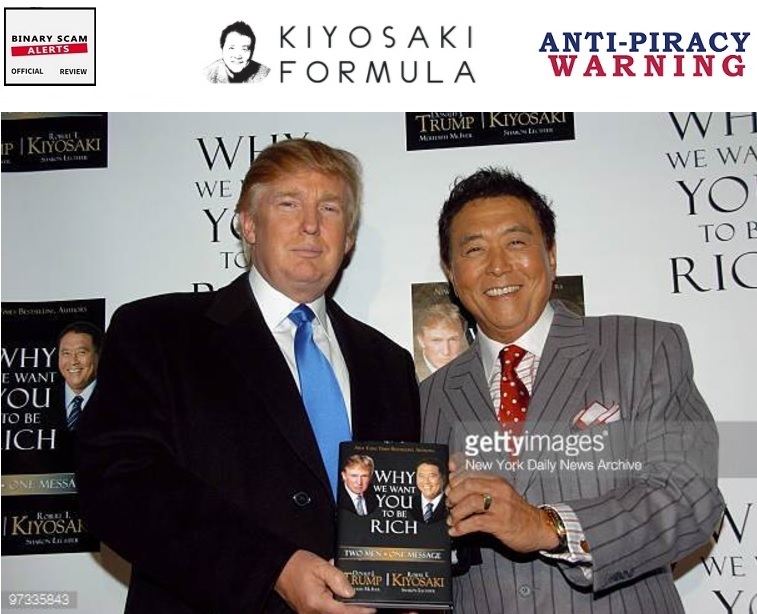 Here’s another screenshot of Robert Kiyosaki, this time its with Donald Trump, before he assumed the title of “Mr. President”. This time is was after publishing his book “Why We Want You to Be Rich” which as co-authored by Trump. We tried to run a background check on him and found out a few surprising facts. His name was tied to various business ventures (most well-known was the nylon Velcro wallets deal) which did not pan out for him and left him bankrupt some time during the 80’s. He also started getting involved with MLM (multi-level-marketing) schemes at about the same time. Amway is one of the company names which were mentioned, and it was referred to as a Pyramid Scheme as well. Kiyosaki is the founder of Cashflow Technologies, which sells motivational books and that is how Rich Dad, Poor Dad was published and eventually made him a self-made millionaire. He is now semi-retired and once in a while gives a motivational speech or shows himself in public to gain some exposure and make some extra cash. You should know that there is no Magic Investing Formula. And if by any chance you have followed the preaching of Kiyosaki about how to escape the rat race and achieve financial success secret money-making strategies of the wealthy, you would come to the same realization. The sales video starts off with Kiyosaki being interviewed and saying :” I really wanted to be rich, so I think number one is desire”. Then, we have a narrator who starts talking about earning money, and says that anyone can become wealthy. Now, you can have “access to his secrets” and cash in on this once in a lifetime opportunity to make it big. The narrator claims the competing software is rehashed, cheap, and run by amateur programmers in India. But not Kiyosaki’s. His team of developers are experts and 100% American. His track record speaks for itself, because he is in the business of making people rich, and that is the difference between him and all the rest. He also claims he is trusted because he used to run “the trading desk for JP Morgan Chase”. Together they partnered and made this “great product” that makes money for everyone. I used to have a life like yours! A job, not enough money in my account. Car payments, bills, life was not fun. He went to a job he hated, and got yelled at by a boss he despised. But it all changed when he met a man who changed a path in his life – Robert Kiyosaki, a “life-changing figure”. You are about to get scammed by professional con artists as this whole presentation is falsified and deceitful at its very core. Fact is, Robert Kiyosaki is not even aware his name and reputation is being tarnished and used to peddle fraudulent software. No detailed information about the technology and how it works has been provided. The hyped-up and exaggerated claims of easy money are very much present, and so are the inflated bank accounts and fake testimonials. No, after you sign up you will be required to invest a minimum of $250 in order to fund your trading account. That money will be charged to your credit card by greedy offshore brokers who care nothing about your financial welfare and will do their utmost to bleed you dry. We have not seen any yet, but we are sure that at some point these will surface as there are numerous “ethical review sites” who get paid and bribed for writing favorable reviews. If you are not quite sure about which system is best for you then you are not alone. Our staff of researchers has handpicked the best and most consistent money-making machines. These are easily available for you in our recommended section. The Kiyosaki Formula by Robert Kiyosaki is a verified investment SCAM designed to wipe out your bank account and steal your money. We know the affiliate network and crooks behind the software, and they all have a checkered past and extensive criminal records for multiple violations having to do with credit card fraud, identity theft, copyright infringement, and software manipulation (rigged and set to lose). We can’t overstate how dangerous this new get-rich-quick scheme is, and if you have been targeted by these vultures we urge you to be extra cautious and don’t take the bait. Regardless, since all of this evidence strongly indicates that we are dealing with a thieving software we have to blacklist it and advise our members and viewers to seek alternative and more legit investment opportunities. We are also available through our Facebook Group and YouTube Channel, so make sure to join and subscribe.